This album contains photographs of slides reported to be of Strathdon and taken around 1900-1910. Details about the background to the slides are noted below. Some of the slides are obviously Strathdon, i.e. Cockbridge, Poldhuillie Bridge and Corgarff and Newe Castles. Some are typical of Strathdon countryside and Strathdon people. Others have Strathdon countryside and buildings with non local looking people possibly actors, and finally some are identified and may not even be in Strathdon. 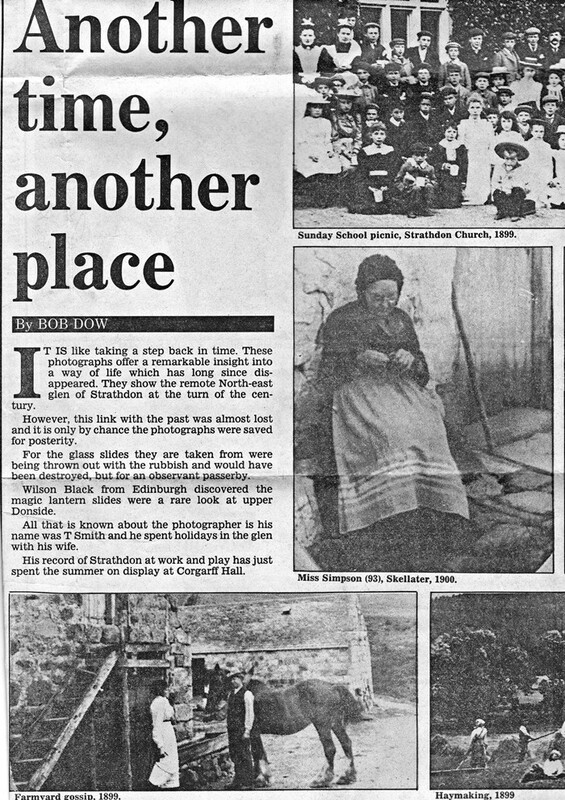 The above article in the Evening Express in Aberdeen on 17th October 1988 throws some light on the background of the slides. It is like taking a step back in time. These photographs offer a remarkable insight into a way of life which has long since disappeared. They show the remote North-east glen of Strathdon at the turn of the century. However, this link with the past was almost lost and it is only by chance the photographs were saved for posterity. For the glass slides they are taken from were being thrown out with the rubbish and would have been destroyed, but for an observant passer-by. Wilson Black from Edinburgh discovered the magic lantern slides were a rare look at upper Donside. All that is known about the photographer is his name was T Smith and he spent holidays in the glen with his wife. His record of Strathdon at work and play has just spent the summer on display at Corgarff Hall.